Instead of the expected character this would get mapped to the ribbon shortcuts since AltGr really is the equivalent to Alt+Ctrl. For 1-6 it would map to changing your HTML style and for “V” it would do a paste special. If you were trying to type an email address with the “@” symbol or type a currency symbol it would be very frustrating. Overall this affected 103 different keyboards used in over 400 locations worldwide. The built in virtual keyboards that come with the operating system do not generally show this issue and you needed to have a real keyboard with an AltGr key. My question to our beta testers is why did y’all not see this in your testing? What can we do different in the future with a beta to help find these type of bugs assuming we cannot find them in-house? The beta was released in at least three countries where the standard keyboard has an AltGr key. 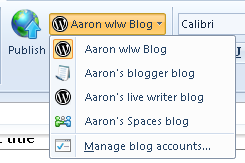 What is new in Wave 4 windows Live writer since the beta? This is a quick post to capture some of the highlights of what has been added or changed since the first Beta release of Wave 4 Windows Live Writer. The development team is not done yet and this is not the full list of changes. I will have individual posts that give more details about some of these items over the next few days. Many of these changes are based off of direct Beta feedback or reinforced changes the development team wanted to make but needed customer feedback to push the work to the top of the list. This did not quite make the Beta but now Live Writer has jumplists on Windows 7. Right click on the application icon in the task bar and you will see jump list entries for recent drafts and recent posts. Drafts and Posts on the application menu. This is another that we new we wanted to change after moving away from the sidebar and many customers let us know that this was a must have. We hope you like the fact that you now have a way to move quickly to drafts or posts via a “most recently used” like list. As WordPress has changed over the years Writer has not kept up with the theme changes. I would like to think that Live Writer is back on par and can accurately detect all current themes from WordPress including their new WP 3.0 theme Twenty Ten. The theme detection changes are not exclusively for WordPress. Writer will now work a lot better with the new custom Blogger themes also and should work better for really any blog server you use. WYSIWYG is much better in Blogger now. I should note that Writer still cannot themes for blogs marked as private on servers such as WordPress. This one kind of surprised us. People really wanted a ribbon button that post draft to blog. We read many reports where people say that they post a draft to their blog and then directly go to the web to actually publish the post from there. No one really went on to explain why they need to do the extra step of publishing from the website but since y’all asked for it we were able to accommodate you. This moved the “Add blog account” button to the Blog accounts drop down list. Writer has always had issues with what is the “right” way to paste content from your clipboard. Should it paste everything that was there. Does it try and make things “web friendly” and exclude stuff on the clipboard that is there but is not needed? With Office there is a lot of CSS on the clipboard that will not be needed in your blog post. If it was pasted it would really bloat your post. We think we have a good compromise of pasting what you need to keep the formatting. Bullets/numbering, heading styles, etc. all should paste better when copying from Office into Writer. I will give a lot more details and examples in a separate post. Yes Live Writer dictionaries were really out of date. It now have the same ones that are included with Office 2010. Live Writer will have updates for all languages that it is released in. 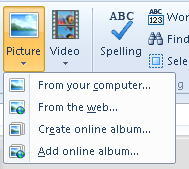 It also has an updated autocorrect list that matches the English list in Office 2010. Photo albums should upload faster now. This is true in Live Writer and also in Live Mail. In Live Mail there is also a better indication as to where you can add additional photos to your album. Live Mail also has some UI to set of a Photo Album expires after 90 days or not. There are more keyboard shortcuts which should appear as help topic on the web and I will have a separate post with the full list. Hopefully this small list make you happy and that the build works much better for you. Please keep leaving feedback in the forums or on feedback.live.com. The Ribbon UI in general gives us the ability to show users functionality that used to be buried deep in menus and dialogs. It also allows to better show UI that only needs to be there when the user needs it. In this post we will explore the Tools tabs in the Windows Live Wave 4 Beta. If you are an user of Office 2007 or later you should already be familiar with Tools tabs. Tools tab appear when you have specific things selected within a document. In Office you may see more than one ribbon tab appear but in the case of Writer we only have one Tool tab per selected item. When you insert a Table in Live Writer or select one you will see the ribbon tab show above as available. 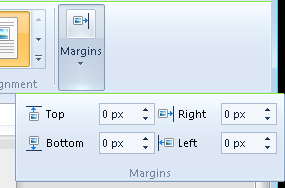 This should look a lot like the Layout tab in Microsoft Word for a table. All of the editing of a table is just one click away. 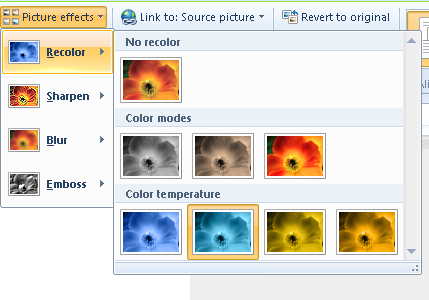 Like Wave 3 you also have all of the table editing available on the right click context menu. In Wave 3 Live Writer the options to format a picture were in the side bar and were in spread across three different tabs. Many people did not know you could do things like add watermarks to images. You also had no visual representation of picture effects. You can have pictures inherit formatting from the blog settings, apply a drop shadow border, apply effects like reflection or rounded corners. You also have effects that make the photo look like an instant photo. Recolor is selected in the case and you can see all of the different options. Sharpen, Blur, and Emboss all have different effects you can apply. In Wave 4 we added a new album style called Squares which is currently the new default. It really complements the album styles we had in Wave 3. Photo Albums are saved to SkyDrive so that you can share your photos with your friends. Much of this UI was buried in the Insert photo album dialog before. 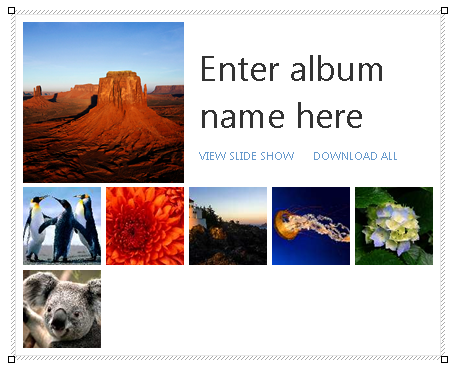 The large button drops down to allow you to pick a few different sizes for the images to be uploaded in your album. You will also notice that photo albums now have links to allow readers of your to launch right into a slide show or download the pictures to their own hard drive from SkyDrive. You have ability to set album privacy settings giving permissions that are set on SkyDrive. The Video Tools tab is really straight forward. View online will toggle to a button to stop an upload if part of inserting a video into your blog is uploading it to a hosting service like YouTube. 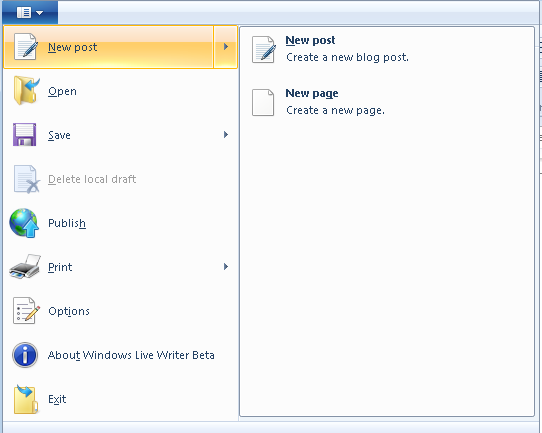 This wraps up the set of posts on the ribbon UI in Windows Live Writer Wave 4 beta. In my next post or two I will talk about new features in Live Writer that are not part of the ribbon. With the primary ribbon tabs for Windows Live Writer Wave 4 Beta covered in previous posts (Home, Insert & Blog Account) lets look at the application menu and Post Properties. The application menu for Live Writer is fairly standard for an application. Under the New Post option you will find New post and if your blog server such as WordPress or TypePad supports it, New Page. Open is just like Wave 3 and you can select from your drafts, recent post, and the list of post per configured blog account. Save will allow you to save a draft locally, save the draft to the server, or save the draft to the server and edit it there. Delete local draft will of course allow you to delete a local draft. Publish will publish your blog post or page to your blog server. Print gives you the option to print or print preview your post. Options will bring up the Writer options dialog. The about box and Exit Writer speak for themselves. Some of the big feedback we received about Live Writer was that users did not know where to add categories or tags. In general people did not notice it at the bottom of the application and after some usability testing we found that when it was up near the ribbon it was much easier to find so me moved it right below the ribbon. The set of fields you see is based off of what is supported by your blog. The picture below is for WordPress.com. 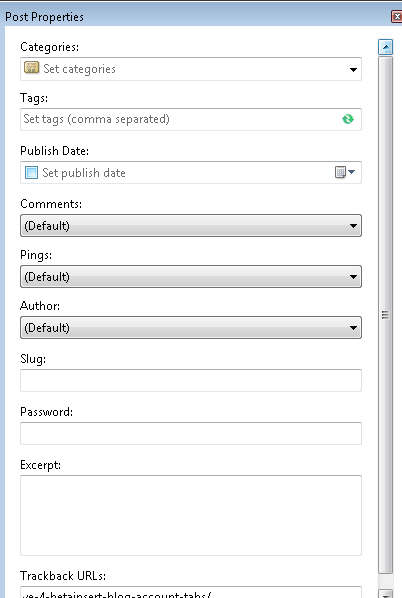 If your blog server supports publish dates for say publishing a post on your server that appears three days from now you can do it by setting the publish date for three days from now. Some blog servers even allow you to see the date to a date in the past. If you click “View all” we bring up a modal dialog that has all of the options that your blog server supports. I have already blogged about the Home tab for Windows Live Writer Wave 4 and this post will be about the other two main tabs Insert and Blog Account. One of first things you will notice is that in the Breaks section is that Live Writer now has added support for Horizontal Line. This is your standard <hr> tag. Clear break is the same as Wave 3. Split post will appear if your blog supports split post. For example, it will appear in WordPress and TypePad but not in Live Spaces. Table is the same as Wave 3. Most of the Media section is the same as what you would find in Wave 3. You can insert hyperlinks. Insert a picture from your hard drive or from the web. From the web is supported again on Windows 7 something that was working in Wave 2 but not Wave 3. 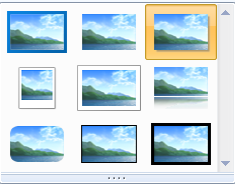 You have the option to create a new photo album to be saved to SkyDrive or insert an existing one you have on SkyDrive. The video button allows you to insert from the web, your hard drive, or a video service like YouTube. The Map button allows you to insert a Bing map. Post tags allows you to quickly insert tags for Technorati, LiveJournal, Flickr, del.icio.us, IceRocket, 43 Things, or BuzzNet. You can also still customize your own provider. 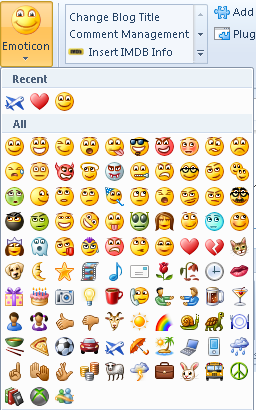 The Emoticons button is new and we are sharing the same set of emoticons as Live Messenger. The same shortcuts you use in Messenger work in Writer also so if you enter “:)” you will see . The Emoticon drop down also has a most recently used list so that if you use the same emoticon over and over you do not have to hunt for it in the gallery as a whole. Plug-ins have moved from the sidebar to the Insert tab. In the image above you can see the ribbon with a few plug-ins installed. You can also add new plug-ins or modify the plug-in options. 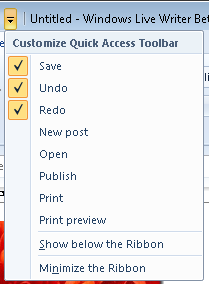 The Blog options button will bring up the dialog with blog specific options. The Shortcuts section is blog specific and can be modified on your blog server with a Writer manifest file. In the picture above the shortcuts for a blog on WordPress.com is show. Below you can see examples for blogs on Live Spaces and Blogger. In the Theme section you can turn off or on if you compose your blog with a what you see is what you get view or not. Update theme gives you the option to bring a new theme down to Writer if you change it on your server. Next I will have a post on the application menu (file men) and the Post Properties. After that I will have a post on the tools ribbon tabs. This post was written in the Wave 4 beta build.